As we are currently basking in some gorgeous sunshine, everything suddenly seems more cheerful and positive … never mind that the sun is showing up all the dust, it’s time to lighten up by adding some sunny yellow shades to our homes. Linda Parker has some bright ideas for new homes! It’s lovely to see that colour trends are warming up, after all those shades of grey, bold blues and jungles greens (not that we don’t like them, it’s just nice to see warmer, softer tones in abundance!) Suddenly all eyes are on shades of yellow and gold, as well as the gorgeous Living Coral (Pantone’s colour for 2019), which we’ve mentioned before of course. 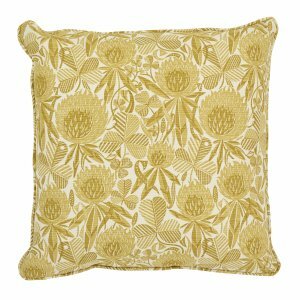 Shades of yellow and gold are the perfect colours to perk up our homes, adding a splash of seasonal cheer and optimism, as well as blending into Mother’s Day and Easter celebration themes with ease. 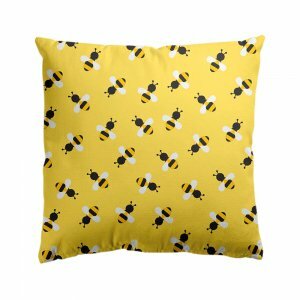 So many Spring 2019 collections feature yellows and golds, so whether you’re eyeing up investment furniture buys or just want a couple of cushions or a lampshade, it will be easy to brighten up your new home. Above: Shades of lemon, blush and copper … latest Spring looks from Marks & Spencer. It’s so simple to add a spritz of spring … and this shows how effective just a small amount of colour can be … banish thoughts of grey days and subtle yellows, naturals and greens. All items here are featured in the new Lisbon collections from Sainsburys. 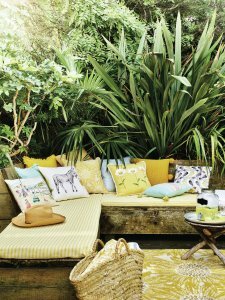 Proof that some greenery, a couple of cushions and a throw can definitely perk up a scheme. 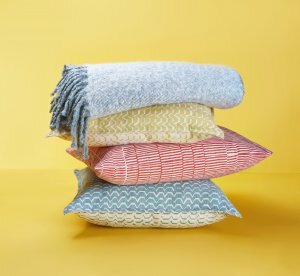 These gorgeous shades are definitely on the sunny side, with small-scale patterns and a snuggly blanket (just in case there’s an evening chill in the air!). Stock up on clear, bright shades for new season accessories to add zest. 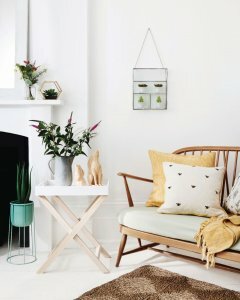 There are all from the latest Retro Scandi collection at Debenhams, which is a brilliant look for newly-built homes – such as Anwyl’s, of course … crisp lines and precise patterns look good in new, smart, light, open spaces. 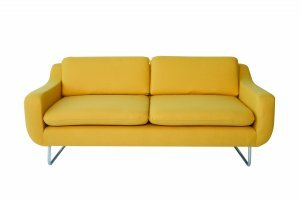 So … if your furnishings are looking a bit beige or bland, and we haven’t yet tempted you with our bright red or pink sofa and chair suggestions in last month’s story, how about a fizz of golden yellow for your living room? This is the Content by Terence Conran Aspen three-seat sofa, which comes in other sizes and gazillions of colours – such as Gainsborough Zest. 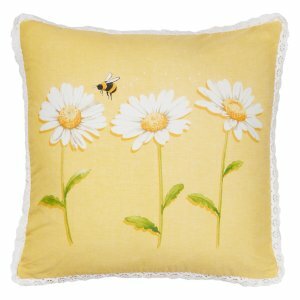 From left; Pretty Yellow Daisy cushion, George at Asda; Bright Law & Moore Bees yellow cushion from Red Candy, and finally, Clover cushion in Honey by St Judes, designed by Angie Lewin. If the new Spring sunshine is making you feel creative, why not start planning your Easter decorations or displays now, taking into account the latest collections. 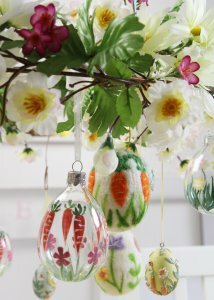 We’re rather struck by Gisela Graham’s new ideas, and think these decorated eggs will look very pleasing hanging from seasonal greenery or branches. Find your nearest stockist here. 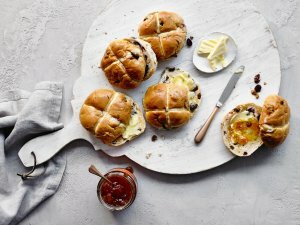 With all this discussion of colour trends and spring news we mustn’t forget one of the nicest things about Spring and Easter … hot cross buns! We know it’s early to judge, but some of the nicest are from Waitrose & Partners … flavours include Elderflower, Lemon & Lovage, and Orange, Cranberry & Jasmine. Testing the other flavours is currently ongoing … and we haven’t even got started on the Simnel cakes yet! Well, if this doesn’t make you feel warm, happy and Spring-like, we don’t know what to say! Combine the elements of a lovely Mother’s Day (31st March!) 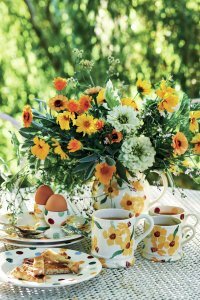 outdoor breakfast treat with some seasonal flowers and the new Daffodils design by Emma Bridgewater, from DaisyPark.